The Jon's Auto husband and wife team is dedicated to complete customer satisfaction while minimizing our environmental impact. We at Jon's Auto strive to operate our business under the Automotive Service Excellence (ASE) principles shown below. 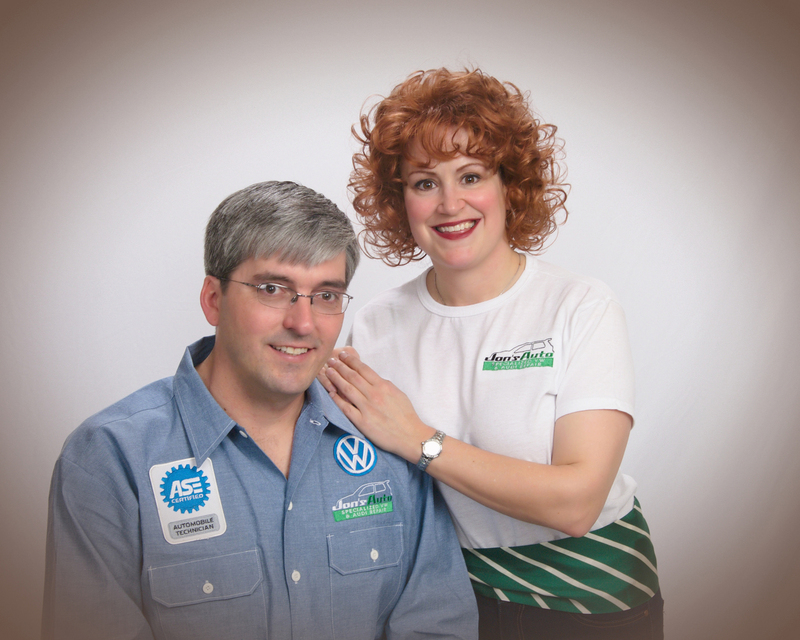 Jon and Kristen are both ASE-certified professionals and passionate VW enthusiasts. Your VW/Audi will always be in the care of an ASE-certified professional at Jon's Auto. Since 2002, Jon's Auto LLC is an independent VW repair shop, owned and operated by the winning team of Jon and Kristen Hamilton. Building lasting relationships with our customers, providing the highest quality workmanship and parts at the fairest price, and increasing the longevity of VW and Audi vehicles are our top priorities. We make it our daily practice to recycle all packaging/shipping materials, removed parts, and used fluids. JON’S AUTO LLC IS GREEN! We at Jon's Auto strive to operate our business under the Automotive Service Excellence (ASE) principles shown below. We will strive to produce nothing but first-class workmanship. We will take advantage of every opportunity to increase our knowledge/skills concerning the work we are doing. We will dedicate ourselves to lifelong learning. We will use only those materials that are proven to be safe and recommended by the Volkswagen manufacturer. We will only recommend service and repair we believe necessary. We will treat an owner's vehicle as we would our own. Because of Jon's six-year racing history with his 2000 VW Golf TDI (Rally VW), fueled with biodiesel, he has gained substantial recognition with the TDICLUB and the TDI community. We are fortunate to have such a diverse customer base who are willing to travel very long distances for our trusted, affordable service and repair. We have customers in all surrounding states and in countless Ohio cities. Pike's Peak International Hill Climb race record holder for the fastest diesel from 2004-2015.